Tourism-sector legislator Yiu Si- wing said Kam made an obvious contribution to the park, turning losses to profit. "It's not something to be written off by one year of loss," he added. As for Lau, he said, he must fight for support from the SAR government and Walt Disney to invest in a phase two development of the park or it will not be able to compete with Shanghai Disneyland, which is three times the size of the Hong Kong facility. The government, meanwhile, welcomed Lau's appointment, citing his "rich experience in theme park operations and infrastructure development both in Hong Kong and in the United States." Financial Secretary John Tsang Chun-wah also expressed appreciation for Kam's contribution to the park and the tourism industry, saying he oversaw major expansion "and drove the performance of the park to new records." 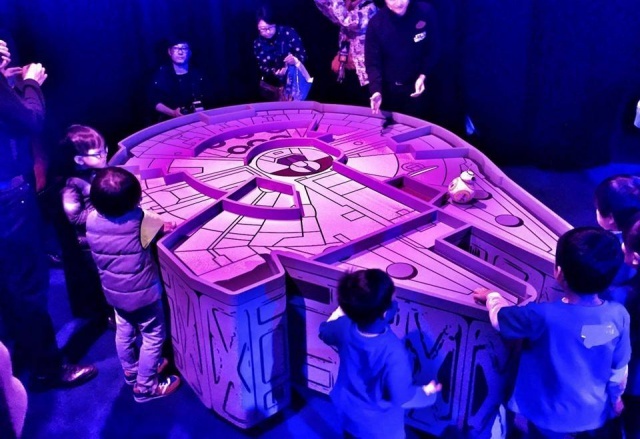 Plus de Star Wars pour les enfants chinois de 3 à 11 ans à Hong Kong Disneyland avec des sessions (payantes) Star Wars de fin avril à fin mai 2016. La participation à ces séance d'animations, de jeux et de concours est tarifée à 196 dollars HK par adulte et 662 dollars HK par enfant. Les sessions sont limitées à quarante participants. Les enfants doivent être accompagnés d'un adulte (maximum deux enfants par adulte). Cette activité ne sera disponible qu'en cantonais. Le forfait enfant comprend également une photo souvenir avec un Stromtrooper, un seau à popcorn TIE Fighter, un t-shirt B B8, une paille BB-8 et un burger menu Star Wars à Starliner Diner. April : 2-4, 10, 16-17, 23-24, 30. May : 1-2, 7-8, 14-15, 21-22, 28-29. Star Wars Burger Combo: Coupon for your enjoyment at Starliner Diner. 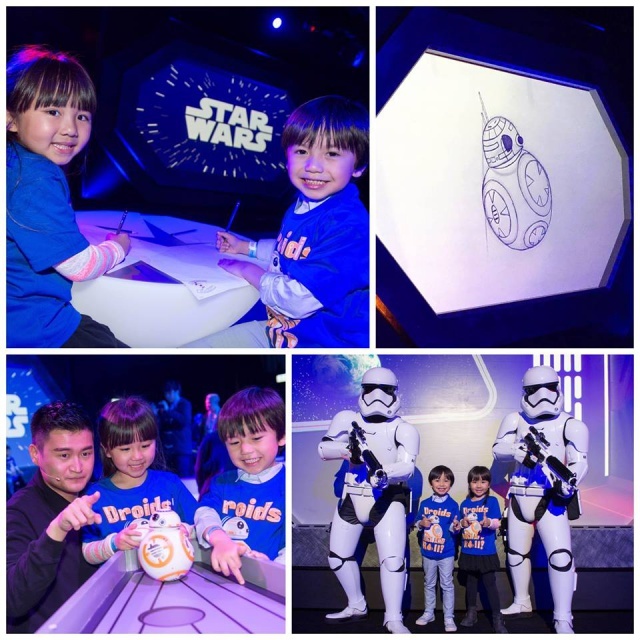 BB-8 remote control toy race (photo : Hong Kong Disneyland Resort). ça fait quand même cheap comme animation, non ? Photos : Hong Kong Disneyland Resort. 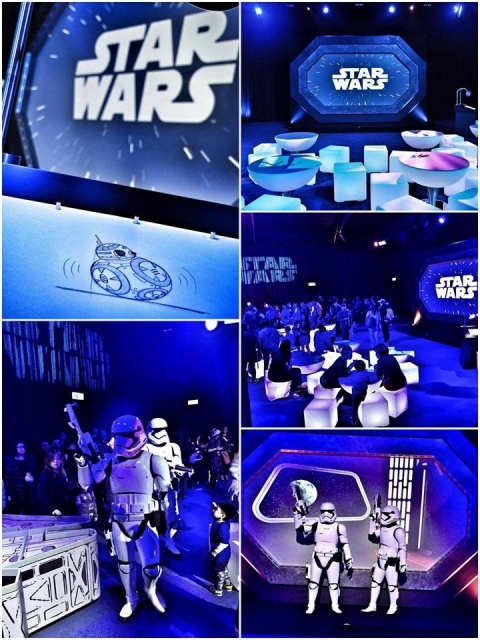 Hong Kong Disneyland：In preparation for an upcoming “Star Wars: The Force Awakens” themed special event, “UFO Zone” will be suspended starting from April 5, 2016. We will announce the details of the special event in due course. 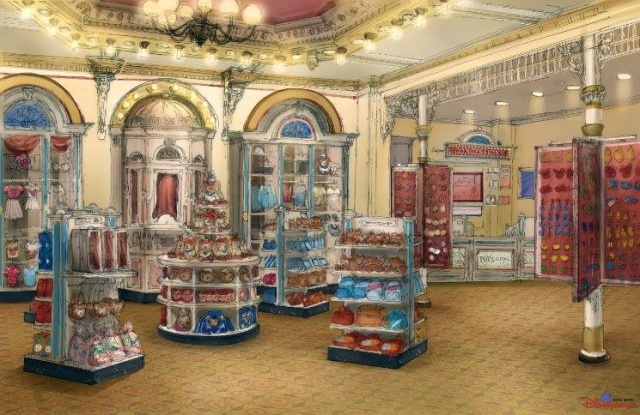 Premières images conceptuelles de la future boutique "Duffy" annoncée le 15 février dernier par Andrew Kam, l'ancien directeur général de Hong Kong Disneyland Resort. Celle-ci ouvrira en juillet prochain. Un nouveau point de rencontre adjacent complétera ce nouveau lieu dédié à Duffy, Shellie May et Gelatoni ! Image conceptuelle : Hong Kong Disneyland Resort. 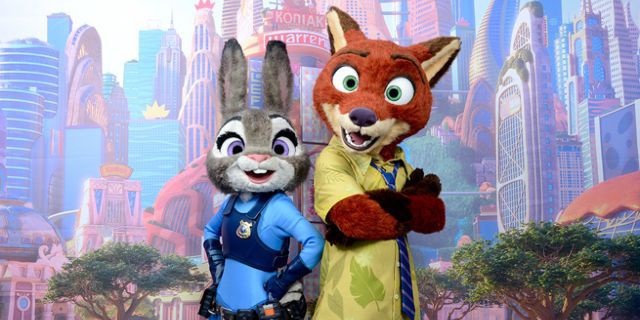 Il sera bientôt possible de rencontrer Judy Hopps et Nick Wilde de Zootopia à Main Street U.S.A. La date de leur arrivée à Hong Kong Disneyland sera prochainement annoncée. Pas de commentaire de la part du management du resort chinois. De son côté un porte-parole du gouvernement local assure que le gouvernement continuera à promouvoir cette destination touristique majeure et soutenir les projets d'expansion du resort en vue de le rendre plus attractif auprès du public. Disneyland eyes job cuts as revenues dip. Hong Kong Disneyland may soon be laying off staff. its understood that the sales and marketing departments will be hit hardest. The park employs around 5,000 staff. The source said the sackings have to do with a drop in tourist numbers and the park's poor business performance. A statement from Disney did not confirm or deny the report. It simply stated that it "reviews its business strategy from time time to increase its business effectiveness and efficiency". "We regularly make operational adjustments to ensure we deliver great guest and cast experiences in a most efficient way possible in order to pave the way for further development," it said. The report of redundancies come a month after the surprise resignation of the park’s managing director Andrew Kam. Last year, the theme park reported a HK$148 million loss for the fiscal year ending October – its first since 2011. Labour Park lawmaker Lee Cheuk-yan said he’s “shocked” over reports of an imminent lay-off, and said he’s worried there’ll be more sackings to come after Shanghai Disneyland opens its gates in June this year. Hong Kong Disneyland fired an unknown number of staff, including some managers, on Friday, with the theme park only saying the figure was “below 100”. This would mark Disneyland’s first large-scale sackings since it opened in 2005, and came just after the park reported a loss of HK$148 million for last year. The park’s first descent into the red in five years was followed by the sudden departure of its long-time managing director Andrew Kam last month, which was never fully explained, and raises questions about its future with competition in the form of the Shanghai Disney Resort, due to open in June this year. Tourism insiders expressed fears that the sackings at one of city’s biggest employers was only the start of “massive lay-offs” in the whole tourism industry, and there were calls for a proper explanation to the public. Disneyland was tight-lipped, only saying the decision was an “operational adjustment” to pave the way for future development while delivering services “in the most efficient way possible”. The Post has learned that back-office staff were targeted for termination – including restaurant and hotel management as well as security. Frontline workers were not affected. All the employees being fired were informed and made to pack up and leave on Friday. Disneyland said they would get better compensation than the statutory amounts. Ellen Cheng Lai-yee, the head of Hong Kong Disneyland’s cast members union, said this was the first major staff-cutting exercise after several dismissals in the past over employees’ poor performance. “We will request a dialogue with the park on behalf of those laid-off workers,” Cheng said, adding that a proper reason must be provided. The Hong Kong government holds 53 per cent of shares in the park, which employs more than 5,300 full-time and 2,500 part-time staff. It has brought about HK$9.3 billion of business to Hong Kong, equivalent to 0.42 per cent of the city’s overall GDP, according to its annual report last year. “It was meant to be an employment project,” Labour Party lawmaker Lee Cheuk-yan said. The veteran unionist said currently employed staff were also worried now, as they feared the opening of Shanghai Disney, which is three times bigger, would result in more lay-offs on the Hong Kong side. Total visitor numbers to the Lantau-based park were down 9.3 per cent to 6.8 million last year, compared with a year ago, as 23 per cent fewer mainland tourists visited. Lee accused the government of shirking its responsibility to Hong Kong taxpayers, while leaving all the business decisions to its American partner, Walt Disney. The government said the park was run by its own management company, which had informed the government about the lay-off plan in advance. “The management company has the responsibility to take relevant actions according to its business condition and operational needs,” it said. “This is just the beginning of massive lay-offs,” said Joseph Tung Yao-chung, executive director of the Travel Industry Council. He added that the persisting tourism downturn amid dwindling mainland visitor numbers had started threatening local employment. SCMP - 16 avril 2016. Pour contrer le futur resort de Shanghai, Hong Kong Disneyland Resort doit impérativement construire un second parc avec un thème inédit, à l'image du resort de Tokyo et son Disney Sea qui à lui seul vaut le détour. Construire un deuxième parc quand le premier n'a jamais réellement atteint ses objectifs et s'enfonce à nouveau, c'est un peu suicidaire, non ? 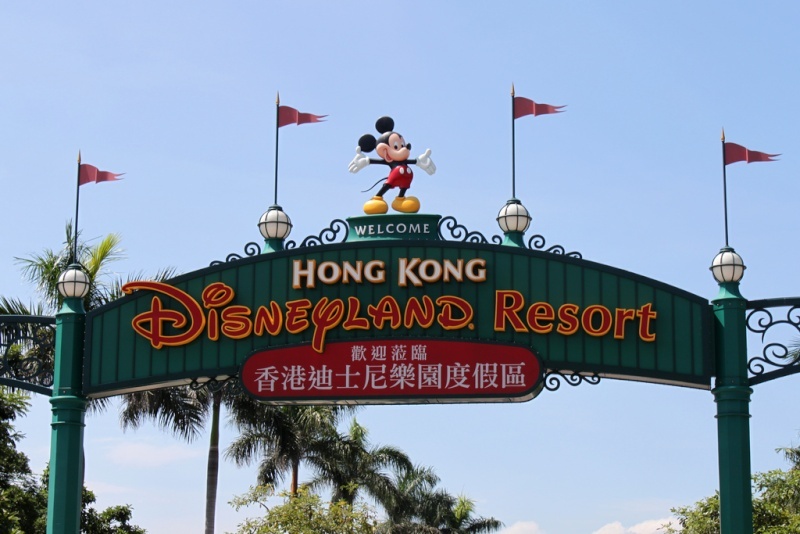 "Hong Kong Disneyland confirms layoffs"
HONG KONG - The Hong Kong Disneyland has laid off some of its employees following reports it has been losing money due to declining tourist arrivals. Oriental Daily on Friday cited a tip-off from an employee of the theme park’s food and beverage division, saying about 100 people had been laid off by the park, 20 of them from the division. The report said that the mass layoffs involved management and support personnel from different divisions including catering, hotels and attractions. A spokesperson for the theme park told China Daily that the layoff was a result of merging various job positions to make the park more efficient. 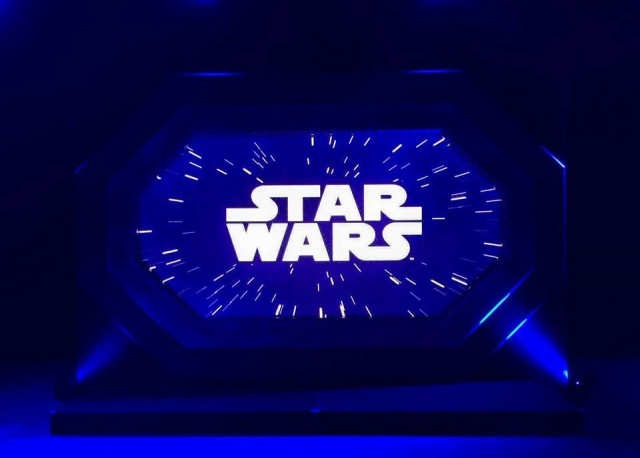 "We regularly make operational adjustments to ensure we deliver great guest and cast experiences in the most efficient way possible in order to pave the way for future development," she said. But she refused to disclose how many people have consented to the dismissal by agreement, only stressing that it was less than 100 people as reported by the media. It was reported that some of those being dismissed have served the park for more than 10 years and were informed on the morning of April 15. They were reportedly told to leave immediately after signing a confidentiality agreement that guaranteed 10 months’ salary as a severance package. The spokesperson confirmed that a few of those who were dismissed had worked for the park for more than 10 years, while a few of them were in high-ranking management. Refusing to call it a massive layoff, she said that it was not a large number of people when viewed in the context of the roughly 5,000 employees the park hired. Early in March, Disneyland’s former managing director Andrew Kam stepped down after the park recorded a HK$148 million net loss in 2015. The loss was attributed to the drastic drop of more than 20 percent in the city’s total mainland arrivals, who make up some 40 percent of the park’s visitors. The impending opening of the new Disneyland in Shanghai might also have contributed to the drop in visitors. Kam, who assumed the post in 2008 when the park recorded a deficit of up to HK$1 billion, had led the park in turning that deficit into gains in only two years. The park notched up a HK$242 million net profit in 2013. Hong Kong Disneyland Resort lance une action à l'attention des résidents de la région spéciale de Hong Kong : à partir de ce mercredi 14h00 jusqu'à jeudi 23h59, les titulaires d'une carte d'identité de Hong Kong peuvent réserver certains type de chambres dans les deux hôtels du resort (Hong Kong Disneyland Hotel et Disney's Hollywood Hotel) pour un séjour entre le 22 et le 28 avril en bénéficiant de 50 % de réduction ! 7. Grasp the opportunity to enjoy our special seasonal hotel discount offer and free spring overlay too! 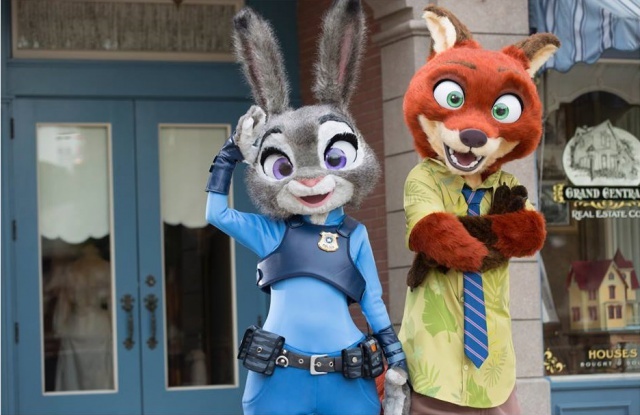 Judy Hopps et Nick Wilde de Zootopia sont arrivés à Hong Kong Disneyland ! 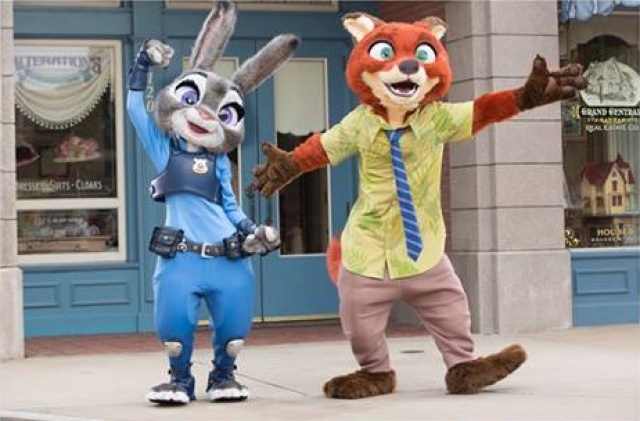 Il désormais possible de les rencontrer à Main Street U.S.A.
J'envie très rarement le Resort chinois, mais là pour le coup, ils ont une sacrée chance !! Les personnages sont sublimes ! Avec le succès du film en France... et un peu de poussière de fée, on peut espérer les avoir chez nous dans trois ou quatre ans à l'instar de Mérida .... .... non ? arff je n'ai rien vu lors de mon passage, il n'était même pas sur le programme des photolocations. Par contre j'ai eu B.Max et Lotso ! 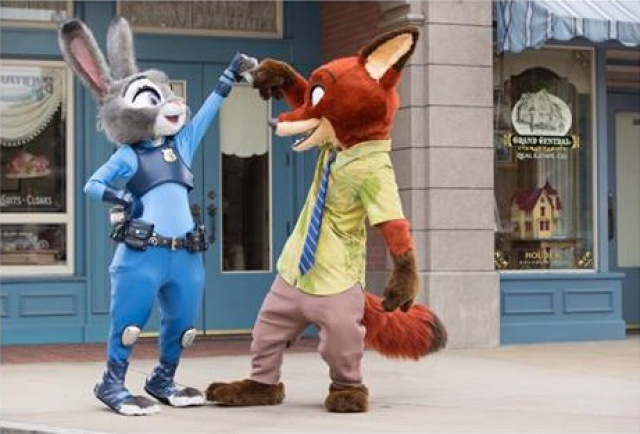 D'après la communication du resort et contrairement à Baymax à Art of Animation ou Lotso, Jessie et Woody à Toy Story Land, il n'y pas de point de rencontre distinct (photo location) mais les personnages de Judy et Nick sortent sur Main Street U.S.A. où les visiteurs peuvent se faire photographier à leur côté. Ils y ont été officiellement présentés la semaine dernière et y seront quotidiennement à partir de ce lundi 25 avril, tu les a donc ratés de peu (il n'y sont bien sûr pas en permanence mais par intermittence). Si tu étais sur le parc vendredi dernier tu as peut-être eu l'occasion de rencontrer Jiminy Cricket et Russel (Là-haut) qui s'y baladaient à l'occasion de la Journée de la Terre. Trois semaines avant sa démission, Andrew Kam avait modifié les plans et avait émis le souhait de lancer la saison dès avant l'été (début juin). La nouvelle direction n'a encore rien confirmé mais il y a une restructuration en cours. 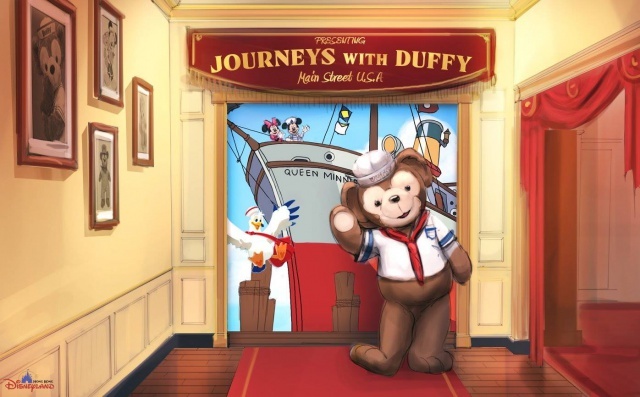 L'ouverture de la nouvelle boutique Duffy, Shellie May et Gelatoni qui devrait ouvrir en juillet pourrait d'ailleurs connaître quelques semaines de retard. 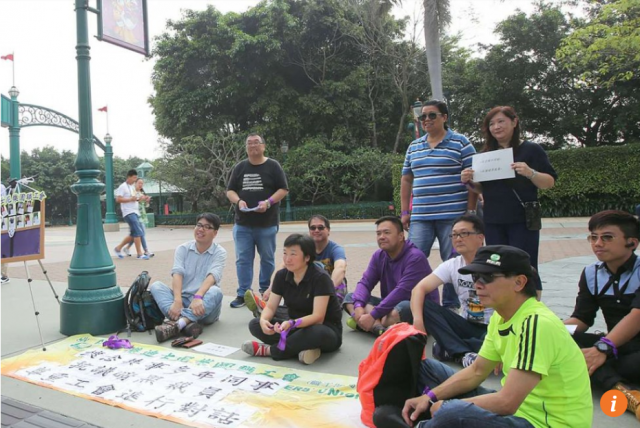 Some staff at Hong Kong Disneyland Park and members of their trade union staged a sit-in on Thursday morning to protest recent mass lay-offs that have rocked the Lantau theme park. A group of nine demonstrators called for negotiations with the park’s management in response to last week’s surprise sacking of around 100 staff. ”I am very angry. My trainer was laid off as well as many of my colleagues,” said Roger Tang Yiu-kee, who expressed concern about losing his job, which he has had for eight years. He operates rides at the park. “We feel like the company can do whatever it wants and does not care about its employees,” Tang added. The demonstrators are calling for greater transparency, and have demanded that there be no more lay-offs. They complained that the trade union was not consulted before the sackings took place. “The company does not respect its workers. We are very disappointed with how this has been handled,” said Ng Koon-kwan of the Hong Kong Confederation of Trade Unions. The park announced losses of HK$148 million last year, its first financial deficit since 2011, as mainland visitors slowed to a trickle. 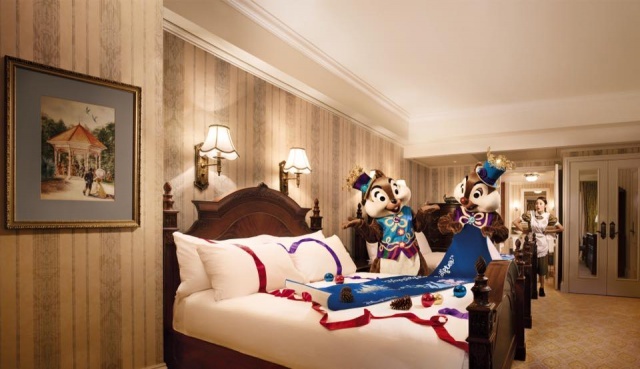 In a bid to boost business, the theme park offered to halve its room rates in the next seven days to April 28 at the five-star Hong Kong Disneyland Hotel and the nearby four-star Disney’s Hollywood Hotel. A room with sea view at the five-star hotel now costs HK$1,650 per night, down from the original HK$3,300. SCMP - 21 avril 2016. Hong Kong Disneyland has halved the room rates at its hotels in a bid to boost business amid losses and layoffs. The offer, which lasts until April 28, was a rare move by the theme park after recording a HK$148 million losses last year and laying off about 100 staff last week. Hong Kong Disneyland Hotel and the nearby four-star Disney’s Hollywood Hotel on Lantau will have the rate of a standard room cut to as low as HK$1,075 per night. A room with a sea-view now costs HK$1,650 per night instead of HK$3,300. The theme park relies heavily on mainland visitors, whose numbers have dwindled. Mainland visitors – who account for roughly 80 per cent of Hong Kong’s arrivals – declined 15 per cent in March year on year, and were down 18 per cent in the first two months of the year. A group of nine demonstrators staged a sit-in on Thursday morning to protest last week’s surprise lay-offs. The demonstrators called for negotiations with park management. ”I am very angry. My trainer was laid off as well as many of my colleagues,” said Roger Tang Yiu-kee, who was concerned about losing his job, which he has had for eight years. “We feel like the company can do whatever it wants and does not care about its employees,” Tang said. The demonstrators are calling for greater transparency, and have demanded that there be no more lay-offs. They complained the trade union was not consulted before the sackings. SCMP - 22 avril 2016. 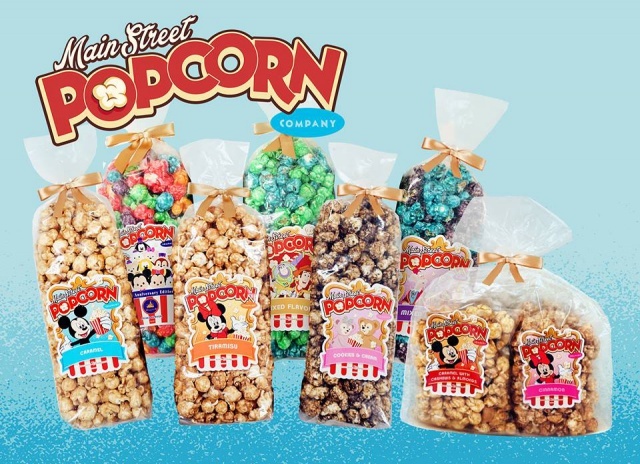 Suivant l'exemple du resort japonais, Hong Kong Disneyland introduit de nouvelles saveurs à son offre de popcorn ! Illustration : Hong Kong Disneyland Resort. La boutique consacrée à Duffy, Shellie May et Gelatoni ouvrirait en juillet (comme prévu) ou au plus tard en août. Merci des infos ! J'espère que ce sera prêt pour juillet ! EDIT : C'est maintenant officiel : Les attractions Space Mountain et Stitch Encounter sont fermées à partir du mardi 3 mai 2016.